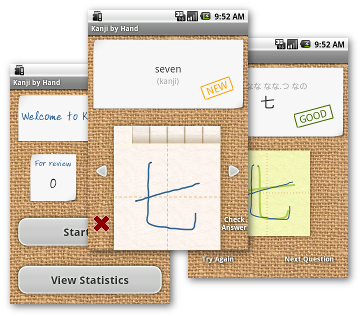 Simply the best way to learn how to write the Japanese characters. Practice wherever and whenever. With instant feedback and spaced repetition you'll be able to learn and remember more than ever. 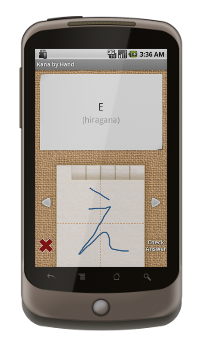 Free version includes the hiragana and katakana alphabets. The full version comes with all the kanji you'll ever need. Using advanced algorithms, our app will tell you right away if you did any mistakes. The instant feedback makes it easier and more fun to study. A tap on the screen is all you need to see how new characters should be written. There's no need to carry around a heavy textbook or dictionary, just bring your phone and study wherever you want, whenever you want. It's really easy to get started. Just start the quiz and you'll be presented with new characters and words to learn. As you go on, the quiz will mix in reviews of characters you learned earlier. All so that you don't have to worry about managing your studies, and can focus fully on learning. A list of common words to learn is included, so you'll boost your vocabulary at the same time as you learn to write. There's no need for you to manually enter lists of words to learn, just go with the flow. For you to learn and retain as much as possible, difficult questions will come back more often. You don't have to worry about what to review. All questions come back at the time that is best for your learning. Do you have both a phone and a tablet? Don't worry, your results can be kept in sync so that you can continue whenever you like with whatever device is closest. Kanji by Hand and Kana by Hand are products from Tokotoko Studio. The packages use data from KanjiVG which is copyright Ulrich Apel and used according to the Creative Commons Attribution-Share Alike 3.0 license. The packages use data from the EDICT and KANJIDIC dictionary files. These files are the property of the Electronic Dictionary Research and Development Group, and are used in conformance with the Group's licence.